It was really cold and snowy in Happy Valley today. How cold and snowy? Let's just say that it gave "football weather" a new meaning in Pennsylvania. All of the grass lots, that provide most of the parking space for Penn State games, were shut down. Tailgating was banned. And Holly Rowe more than earned her keep on the ESPN sideline. Here is a photo of bundled up Holly and camera during a post game interview, being shot by a bundled camera. 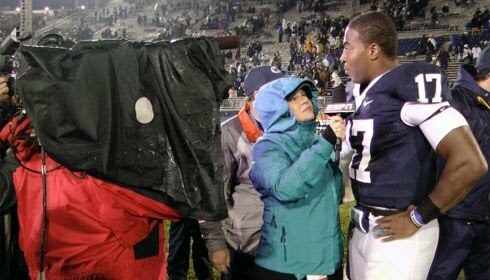 ESPN's Holly Rowe interviews Penn State's Daryll Clark. Photo Courtesy Penn State.